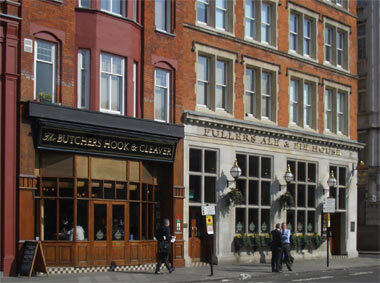 The Butchers Hook & Cleaver was established in 1999 as concatenation of two distinct buildings, The Midland Bank, 60-62 West Smithfield and a wholesale meat supply shop next door. As you would expect, the interior is large and has been tastefully styled as a traditional pub, although I doudt there is any authentic features remaining of either building other then there facades. There is a spiral staircase leading to a large upstairs balcony, which provides an lovely view of St Bartholomew's hospital across the square. On our visit there was ESB, London Pride, Chiswick and Indian Pale Ale and you can see why this gained Fullers Best City Pub in the Griffin Trophy for 2005 and was a finalist in 2006 & 2007. There is plenty of history to be seen in the Cities northwest region, Smithfield Market and Smithfield Gate (circa 1300) are just a stones throw from a decent pint of Pride, perfect.